‘Tis the season for preserving the harvest! Calgary has such a short growing season, with such an amazing bounty of local produce that we must do our best to make it last. One of my favourite ways to preserve the harvest is to can it! If you haven’t canned before, it may seem like a daunting task to start. Don’t be scared, it can really be quite an enjoyable process. Newer canning books also focus on smaller batch, artisanal recipes that are definitely a manageable place to start. When canning, it is important to follow a recipe specific for canning to ensure the safety of your final product. That’s why I went to the experts on these recipes, and used two of my favourite canning books: Canning for a New Generation by Liana Krissoff, and Food in Jars by Marisa McClellan. First you need to peel your tomatoes. This isn’t as hard as it sounds, trust me! First, using a sharp knife, score a small ‘x’ on the bottom of each tomato. Now, simply bring a large pot of water to a boil and fill another large bowl with ice water. Drop a few tomatoes at a time into the boiling water for 30 seconds – 1 minute. Scoop out with a slotted spoon and transfer to the ice water. The skins will just slip off easily at this point. Now for the fun (and messy!) part; you’ll want two bowls on hand, one for the seeds, and one for the tomatoes. Break the tomatoes apart and scrape out the seeds and core with your fingers. In batches, put the tomato flesh in food processor or blender and puree until smooth. Keep going until you have 12 cups of puree – that is all you need! In a wide preserving pan or stockpot, heat the oil over medium-high heat. Add onion and sauté until translucent – about 5 minutes. Add garlic, stirring constantly about 1 minute. Pour in all 12 cups of tomato puree and bring to a boil. Lower the heat and simmer for about 45 minutes, or until the sauce darkens and is reduced by one third. I find it takes a bit longer that 45 minutes to get the consistency I like, but it will depend on your preference, and your pan! Season with salt to taste. In the meantime you can prepare for water bath canning. For full details on the proper method for canning, you should use a canning book or check out a website like the National Centre for Home Food Preservation. 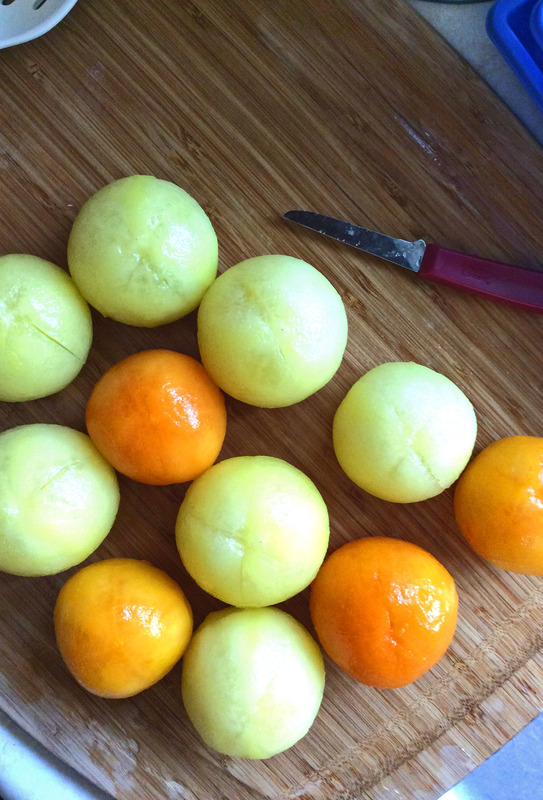 Put ½ tsp of citric acid in each jar. Fill jars with hot sauce with ½ inch headspace. Wipe the rims, put your lids on and place the jars in the canning pot full of water. Once the water has reached a rolling boil, start your timer for 35 minutes (plus adjustments for elevation*). Remove the jars from the canner when complete and set aside for 12 hours. If you notice any that didn’t seal, put them in the fridge immediately. Label and store! Prepare your boiling water bath and 4 quart jars according to the proper canning process. Core your tomatoes using a sharp knife, and score the bottoms with a small ‘x’. Bring a large pot of water to a boil and fill another large bowl with ice water. Drop a few tomatoes at a time into the boiling water for 30 seconds – 1 minute. Scoop out with a slotted spoon and transfer to the ice water. The skins will just slip off easily at this point. Bring a fresh full kettle or pot of water to a boil. This will be the liquid you add to your tomatoes to fill any voids. Add 2 tablespoons of lemon juice to each prepared jar. Gently pack the peeled tomatoes into the jars. Squish them in as tightly as you can without mangling them too badley, and pour the boiling water over the tomatoes with ½ inch headspace. Use a wooden chopstick or similar utensil to remove any air bubbles. I ended up cutting a few tomatoes in half to make them fit well into pint jars. In our household, we don’t often need a full quart of tomatoes at once, so smaller jars seemed like a better option. Of course, I adjusted the quantity of lemon juice to 1 tablespoon per jar. Wipe the rims, put your lids on and place the jars in the canning pot full of water. Once the water has reached a rolling boil, start your timer for 45 minutes (plus adjustments for elevation*). *Because tomatoes are lower acid than some fruits, it is important to add an acid like citric acid or lemon juice to your jars, just follow the directions of whatever recipe you are using. *Most canning books will recommend adding 10 minutes to the water bath canner time for Calgary’s elevation of about 3500 feet. 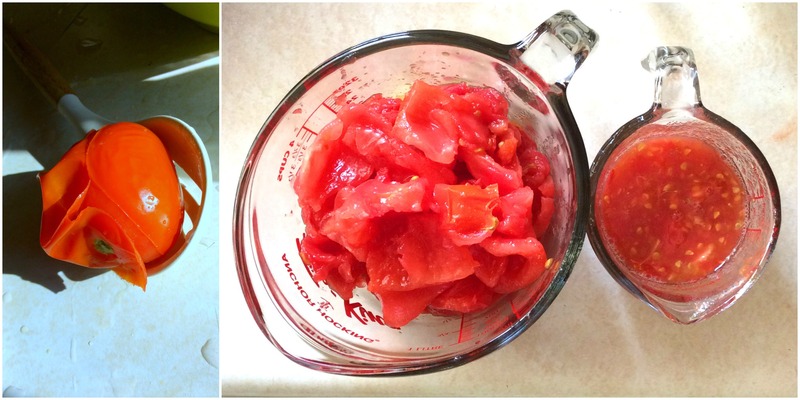 There you have it – two ways to can tomatoes. 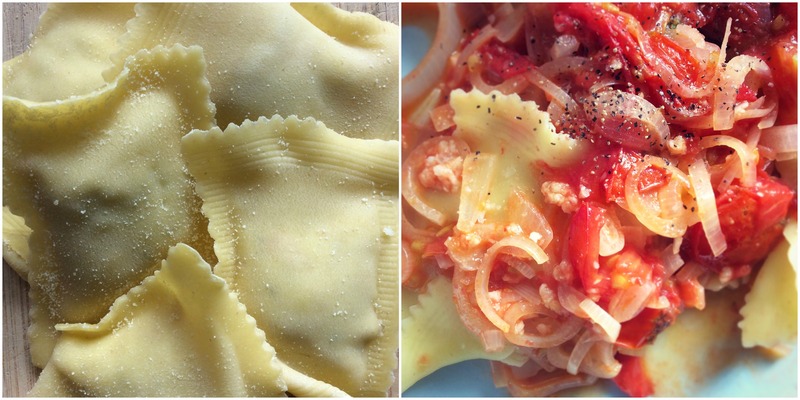 Hopefully these two all-purpose recipes will be welcome additions to your pantry come winter! 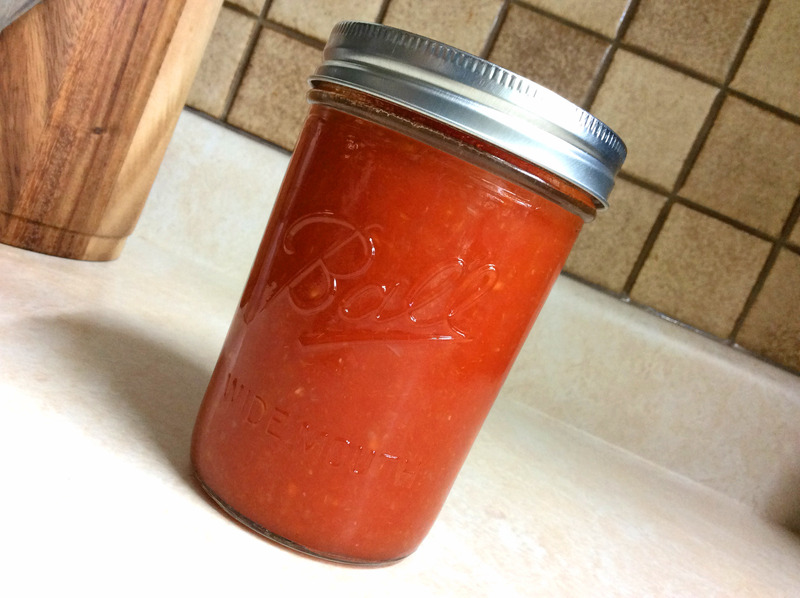 This is my second season canning with tomatoes from Gull Valley Greenhouses, and I have to say – they are wonderful to work with and perfect for canning. Large, firm, uniform Roma tomatoes are a breeze to peel and taste delicious too! Whole tomatoes can be used in any recipe that calls for them, like soups, stews or thicker sauces. Tomato sauce can be poured over pasta, used on pizza, as a base for more complex sauces – the possibilities are endless, really! For example, I couldn’t resist using the leftover sauce that didn’t fit in my jars on some Veal Ravioli from Soffritto’s! Yum! 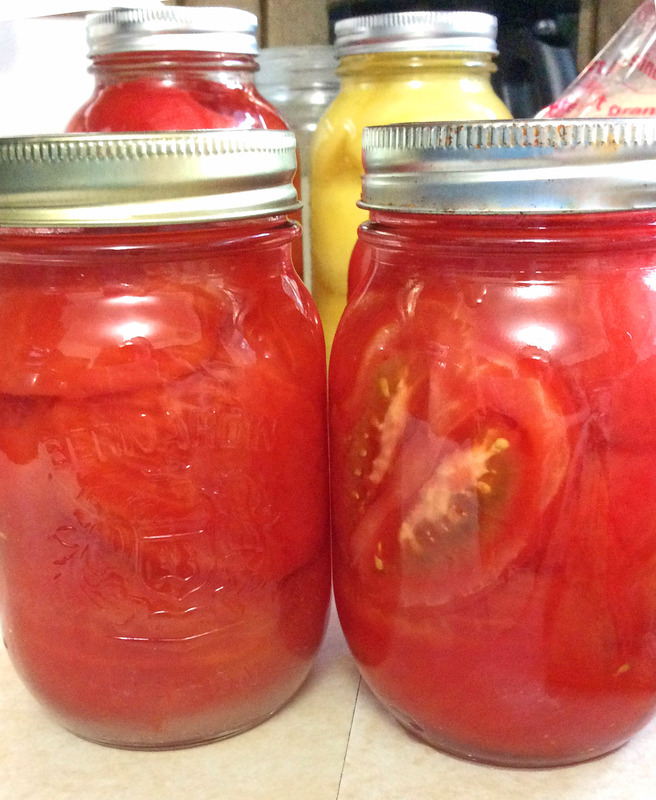 If you’re looking for more ways to preserve tomatoes, check out the Food in Jars blog – it comes chalk full of ideas! For even more canning recipes, check out our blog post from last year: Canning Extravaganza! If you’re anything like me, once you start canning – it can get a little addicting! It’s a good thing there are plenty of canning resources and books out there. I’ve shared two of my favourite books in this blog – which are your favourites? Leave them in the comments section below. There’s no better place to start preserving the harvest than the Calgary Farmers’ Market!